Tomorrow is Father's Day. While pessimists might just say that it's merely a marketer's gimmik, I still believe that it's a perfect day to honor the man of the house -- our Dads. After all, how often do we really get the chance to stop and say thank you for all that he has done for the family right? 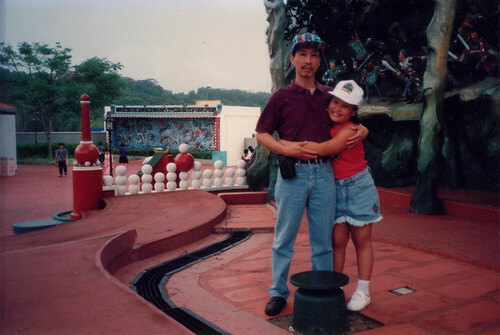 Recently, Paul and I got the chance to sample the delicious Father's Day Menu at Caffe B in Marina Bay Sands but before I start talking about food, let me tell you more about the first love of my life, my Papa. Papa was turning 37 years old when I came into this world. Perhaps, a lot might say that that's just the right age to have a kid but for him, I'm pretty sure he was battling a whole bunch of emotions from happiness, excitement and the very inevitable anxiety. Just like Mommy, I'm quite certain that they had no clue how to raise a child and so I was luckily their guinea pig. They will never admit it but you know what? I think my parents passed the parenting test with flying colors. After all, raising a child, making sure she turns out well and excels in whatever makes her happy in life is not a joke. Papa has been a very doting father since day 1. Every single school day, he and Mommy would make it a point to bring us and pick us up from school. Friday is always a happy day because we would go out for merienda and there was even a time when we would go to SM Megamall every week and they will allow me to shop for a new top or pants in hopes that I'll finally get into the habit of updating my wardrobe regularly (which sadly, I haven't still haha). Then there's my addiction to teen fiction books (hello, Sweet Valley Kids and Twins!) where despite Mommy telling me to just choose one book to buy, Papa would give in to my sweet pleas and purchase all the books that were on my hand. Papa's indeed a spoiler! These are just some of the happy and funny memories that I have of Papa and I tell you, there's a lot more! That's 34 years worth of memories and still counting. How I wish I'm back home to celebrate Father's Day with him and the family. For all of you who are fortunate enough to celebrate this special day with your Dad. Take my advice, please make the most out of it. One idea is to take him out for a nice meal and make him feel like a king. So going back to our dinner, Paul and I got to sample a delicious 5-course meal for only $70 (top up for $40 if you want it with wine pairing). 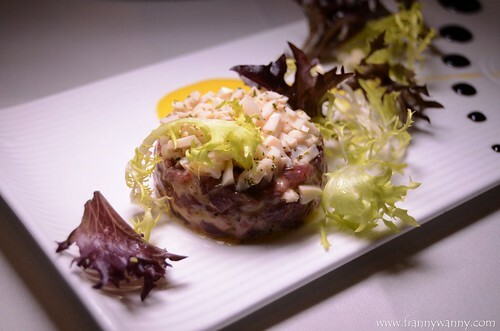 The meal started off with Sous Vide Beef Tartare which is a combination of raw diced Black Angus Beef, shallots, gherkins and capers with hollandaise sauce and topped with minced egg white. I have to admit that I'm not crazy about eating raw beef so Paul pretty much wiped this up. That one small bite that I had though was pretty good. I was surprise that you don't get to taste anything bloody or raw but rather the mix of shallots, capers and egg white gave it a nice texture. Next we had the Capellini Al Gamberetti. As you all know, I love love love pasta and seafood so I was so excited for this one. However, I felt the pasta noodles were not that al dente but flavor-wise, I love the strong garlic aroma and the shrimps were very fresh and plump. 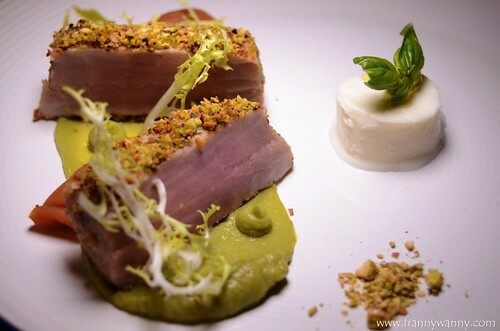 Moving on, we had the Pistachio-crusted Maguro (Tuna) in Guacamole Puree. Another seafood dish and I have to say that the tuna was delicious! It had a nice flaky texture and the guacamole brings a strong citrus punch. What sealed the deal for me though was that piece of mozzarella on the side. I'm crazy about cheese and while I thought it doesn't really complement the over-all dish, it was a nice treat nonetheless. Of course, for the man of the house, you gotta give him some MEAT. 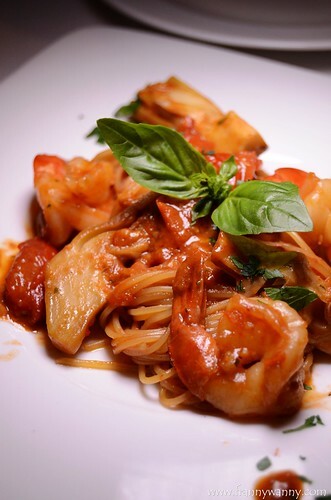 So, for the Father's Day Menu, Caffe B has prepared another winning dish. 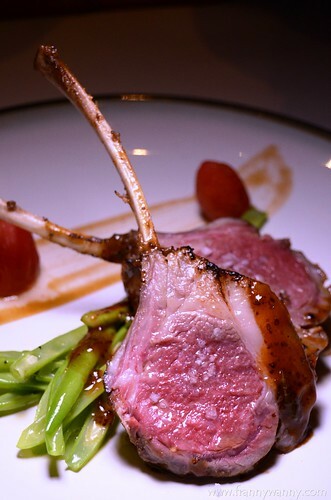 The Rack of Lamb Glazed with Plum Wine totally got us swooning and whispering "wow" in between bites. We love the tender lamb meat with a thin layer of fat which somehow "caramelized" giving it a nice crunchy, buttery bite. It was served with buttered beans and tomatoes which was so delicious too. This was a winner and clearly our favorite that night. For dessert, we were served the White Chocolate Caramel Brownie. Baked chocolate walnut brownie topped with caramel sauce, white chocolate, mascarpone and cream cheese. 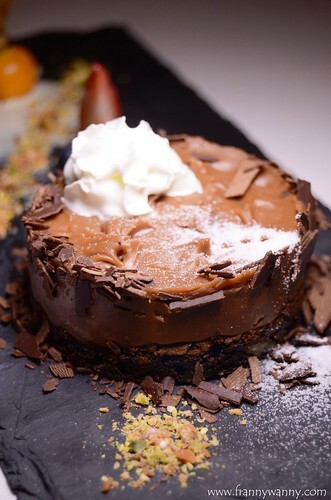 Not one of Caffe B's best desserts but if Dad is a chocoholic then this might just win his heart. Check out this special Father's Day menu tomorrow at Caffe B! Happy Father's Day to all daddies!